Before the Wilsonart installers arrived I cleared off all of my counters and I also emptied out all the lower cabinets including under my sink. I knew that they would need to have access and I didn’t want anything to get in the way of doing their job. I also removed my drawers. Warning these are not pretty photos. After I had my kitchen ready I was anxiously awaiting the arrival of my plumber. Once he arrived he removed my kitchen sink. Just as he was finishing the counter installers arrived. They worked on my counter with my kitchen sink. I set this up so the plumbers could come take the sink out. Then as soon as the installers were finished with that counter, the plumbers could finish and install the kitchen sink. But there was a problem. The sink wasn’t fitting in the opening. So they had to cut out more of the counter opening so the sink could fit. This went on for about 4 or 5 times before it was right. Hey things happen no big deal. But this was a great lesson and one I share with you. 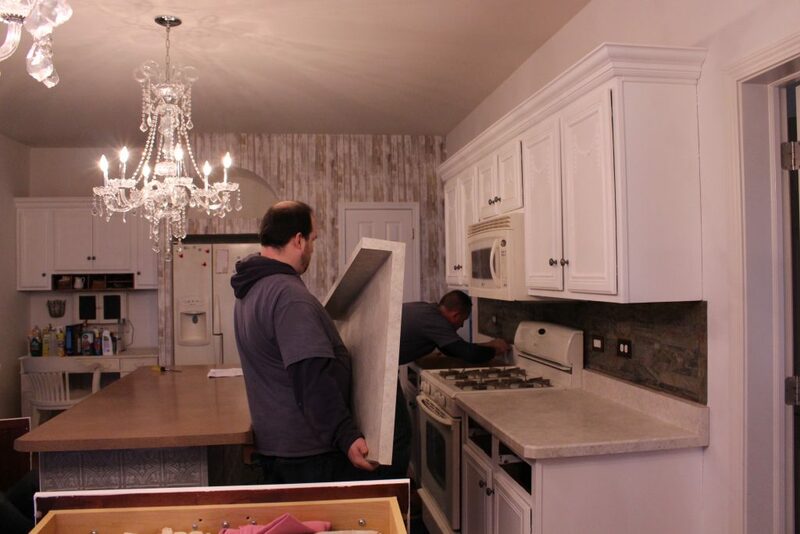 When you’re having your counters installed, make sure that they start on the sink portion first. Then ask your plumber to stay until they install that counter so they can then immediately start installing the sink. If a problem arises this can be fixed with the plumber on site. If my plumber had left and came back after the counters were installed that would have been a problem as they may not have been able to come back in the same day. Wow what a difference. 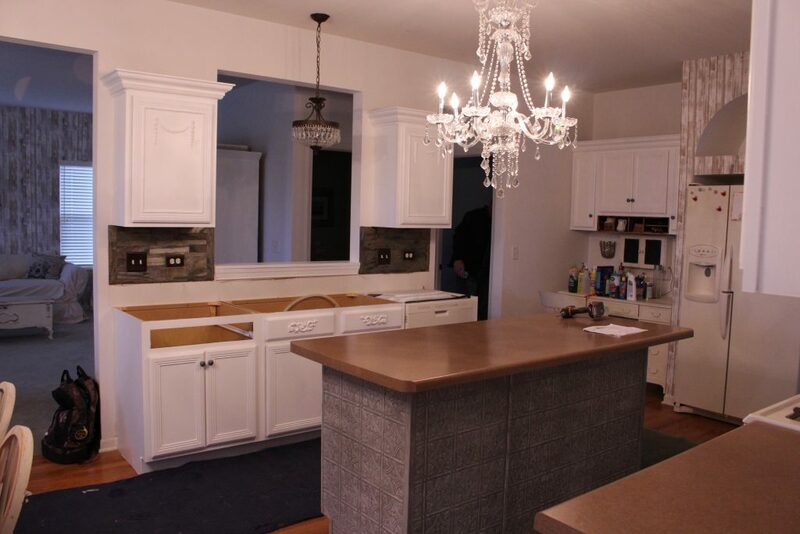 Here you can see what my old counters looked like next to my new installed Wilsonart counters. I could immediately see how nice bright and more open my kitchen looked. Those old counters didn’t fit in at all with my current style. 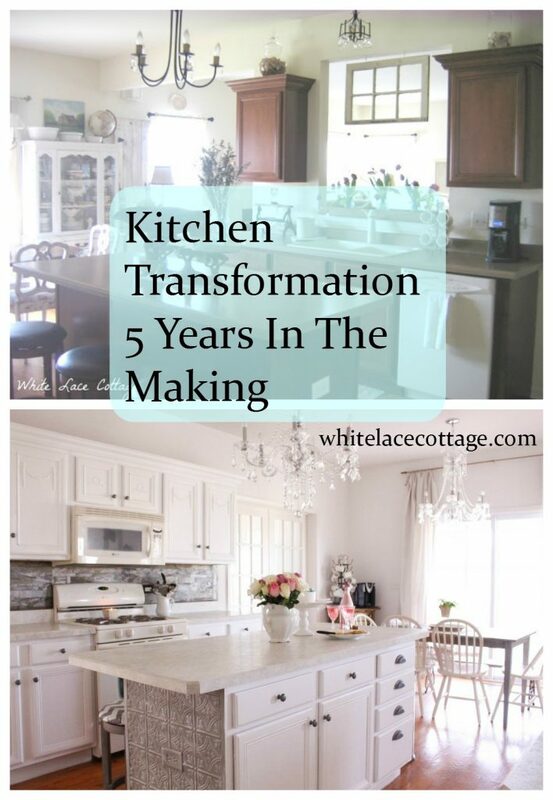 Before I share the photos of my kitchen and how it looks like now, let’s take a look back to how my kitchen looked five years ago. Yep this is my kitchen five years ago. I cringe looking at these photos. My kitchen was so dark. My style was not pulled together at all. I just see stuff everywhere. I didn’t have my cabinet hardware. Speaking of cabinets this was before I painted my kitchen cabinets. The light fixtures were an upgrade for me. I found them at thrift stores. I didn’t have the funds for chandeliers yet so I bought what I could afford at the time. This was right after I painted my kitchen cabinets. Sorry for the horrible photos. I really had no clue at this point of how to edit my photos properly. Lots of yellow in these photos. Then I decided I needed to paint my kitchen island and add my ladder above my sink. 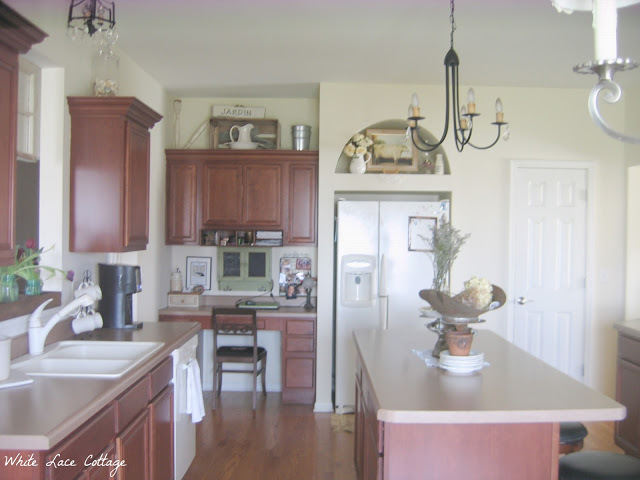 I also took those doors off of my cabinets to give it an open look and feel. 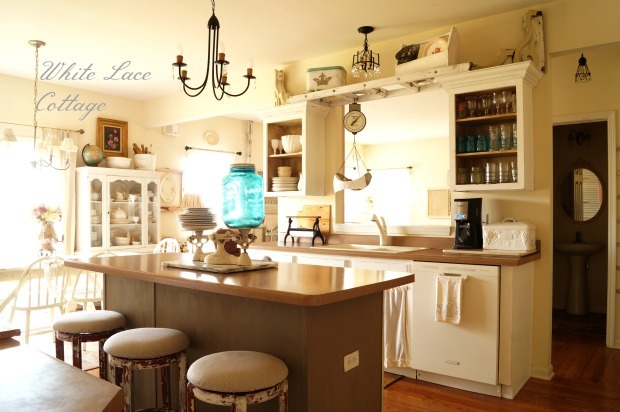 I think I was into a shabby farmhouse style. I started falling for pink. 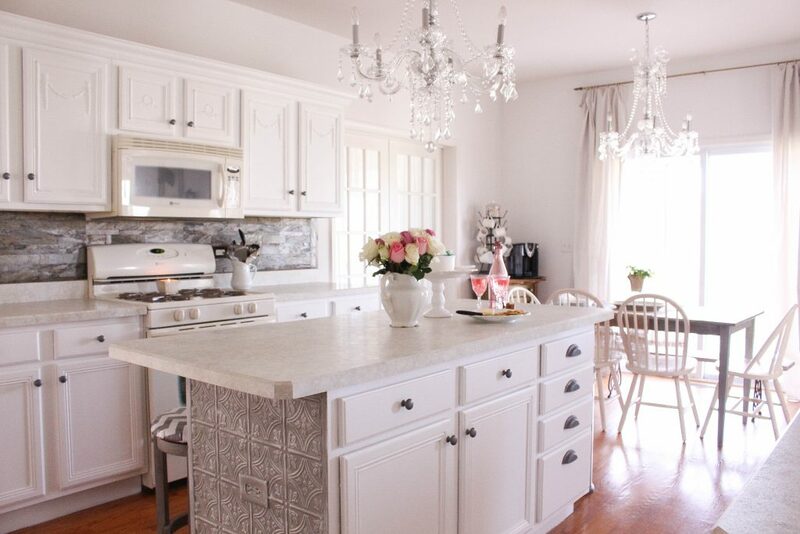 I added wallpaper beadboard to my kitchen island and painted it pink. To age it I added a dark wax. I also switched out my old chandeliers for crystal ones. They were purchased at Menards but they no longer carry these. I was growing tired of pink so I decided to go with green on my kitchen island. This island has been updated the most in my kitchen. I also painted a chalkboard wall to give my room an accent wall. 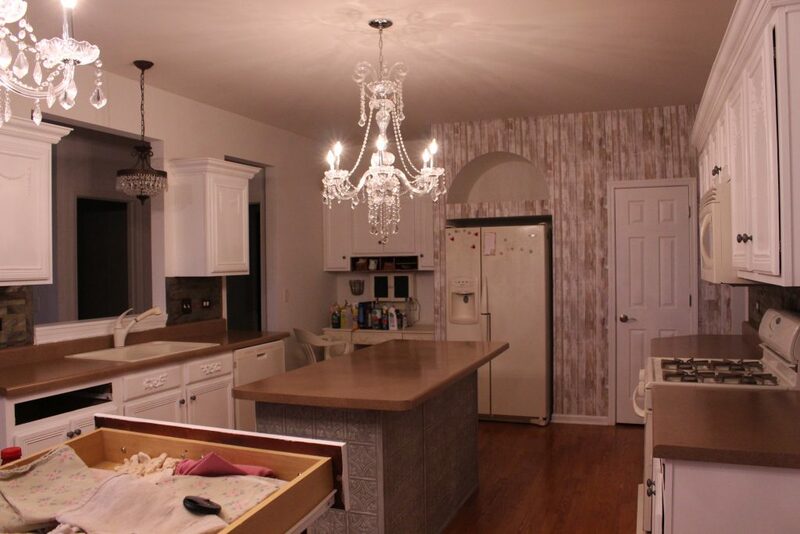 I added a faux backsplash using a stencil and Venetian texture medium. 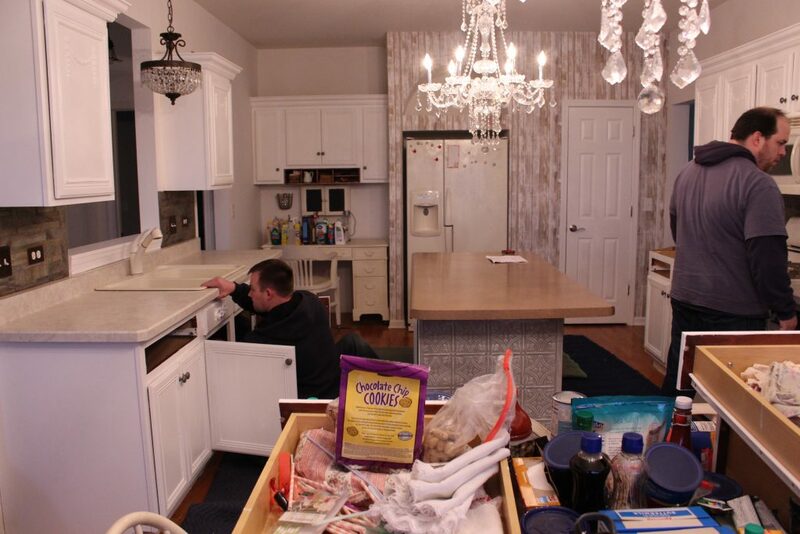 I told you that my kitchen has gone through lots of changes. But these counters from Wilsonart finally pulled my kitchen together. I’m absolutely thrilled with the results! 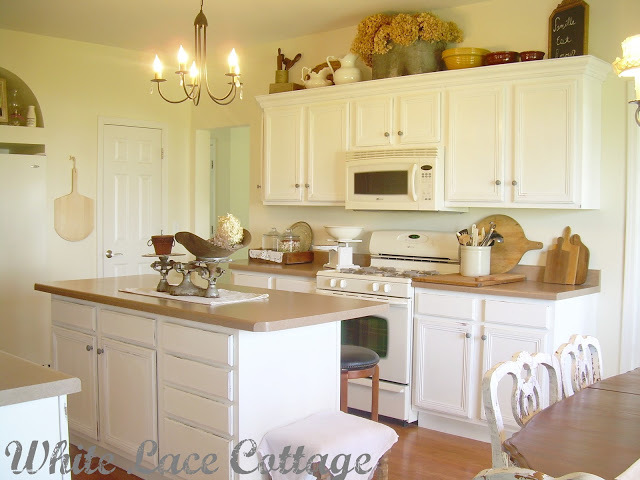 Make sure you read Choosing The Right Laminate. 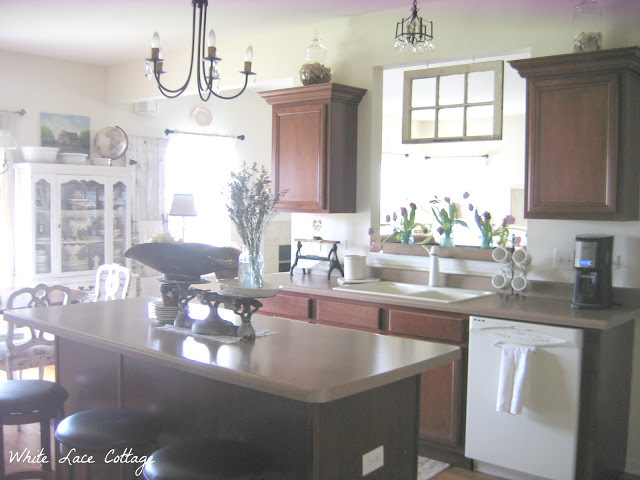 I share the process of choosing my Wilsonart counters. Again I want to thank Wilsonart. This is a dream come true for me. 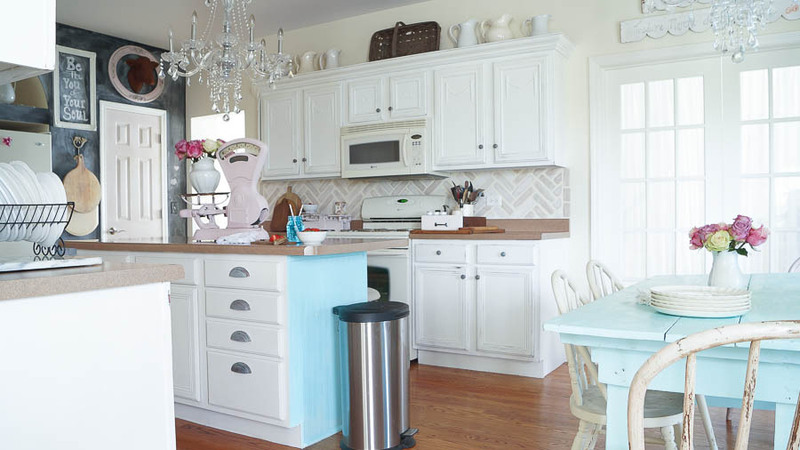 This truly is my dream kitchen. I don’t think I’ll ever have one as large and as beautiful as this one. My Wilsonart counters really brought my kitchen to a new level and pulls my whole room together. For more on Wilsonart click HERE. Sharing more details on my kitchen on my latest video. 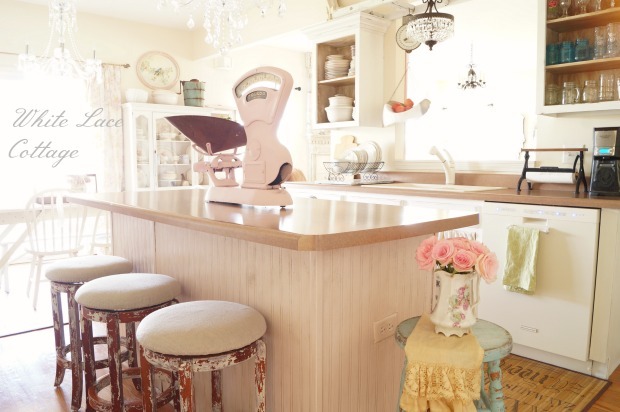 I remember discovering your blog when your kitchen was in its’ pink stage (so was I at the time). I fell in love with the ladder above the cabinets, your pink scale, the island, and a table you had in a corner. 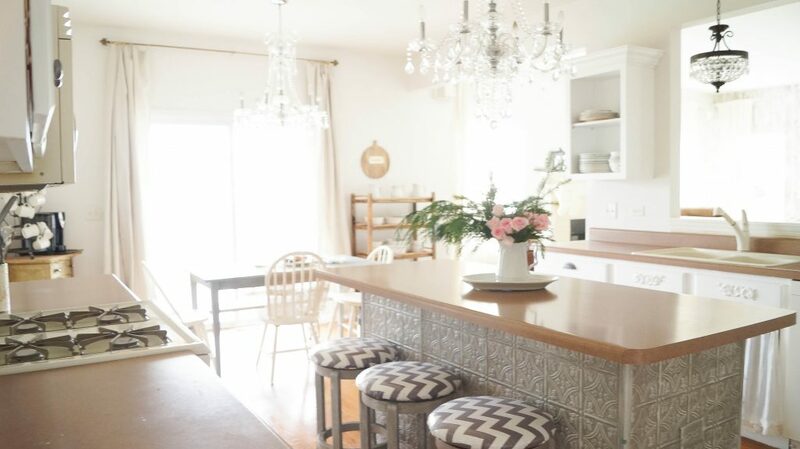 My tastes have also changed, and I too have removed most of the pink and florals, and have moved onto neutrals in gray, white and wood – with decor being uncluttered and not fussy. I still get heart eyes when I see a magazine feature of a cottage done in soft pinks and florals – so I do use some pale blush color on pillows and fresh flowers. 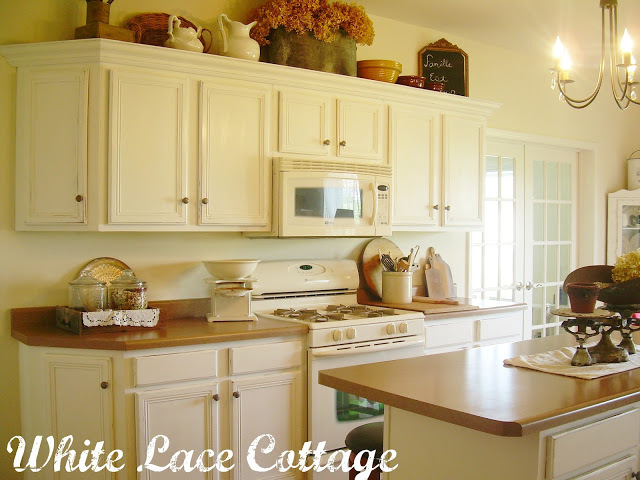 Your new kitchen is lovely and it has been fun reading about your evolving style. It turned out beautiful but did it really take 5 years or did it just feel that way! We started a redo about 6 weeks ago and at this time it feels like 5 years!! I am just so over this and want it over…….it’s been held up over a cabinet that was sent wrong and we finally received it so hopefully this week it will be done or I might go to jail cause I can’t take it anymore!! And I might just have to step on our contractor toe or throw a bucket of paint at him, Ugg but like your kitchen a lot!